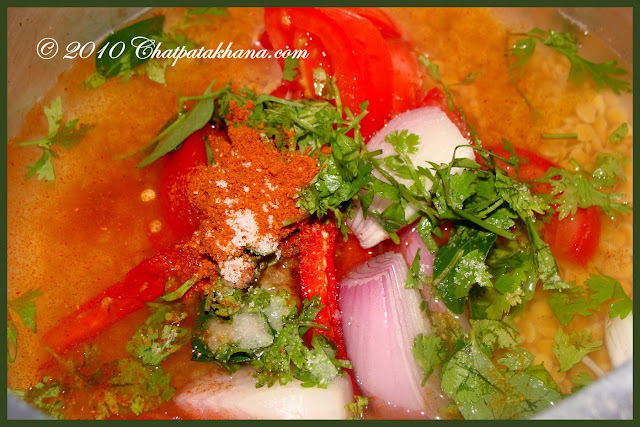 This is the quickest recipe which I use to make sambar. It turns out really well. Give it a try and let me know. Mix all the ingredients in a pressure cooker as shown above. Cook it for 5-6 whistles till the dal is boiled completely. The time will depend on the pressure cooker type and make. Open the cooker and set it aside. Now prepare the tempering. Heat oil in a pan and add the mustard seeds and hing. Once the mustard seeds crackle add rest of the tempering ingredients. Pour the tempering over the boiled dal. Add extra water if needed and cook on a low flame for 10 minutes. Add fresh coriander leaves to garnish. You can also adjust the seasoning according to your taste. i love sambhar and this is the quickest ay to cook it .so thank u so much for this recipe.now,i can make sambhar as quicker as my mother do.